A contract for Espoo’s Suurpelto city center block with ICON Real Estate Funds Ltd.
EKE-Construction and ICON Real Estate Funds have signed an agreement on 9/27/2017 for Espoo's Suurpelto city center block project management contract. With the project management contract, ICON Real Estate Funds Ltd. will construct a building entirety of 25,000 square meters in floor area in Espoo's Suurpelto city center block. The entirety will include apartments, business premises, an apartment hotel and the parking spaces that these require. "Espoo's Suurpelto is a developing construction area that's one of the largest in Finland, where up to 15,000 people will live in the end. ICON Real Estate Funds is in a privileged position in getting to construct a city center block in the area, the definite pride of which is the 20-storey tower block that will become a landmark for the area," says the CEO of ICON Real Estate Funds Ltd, Markus Havulehto. 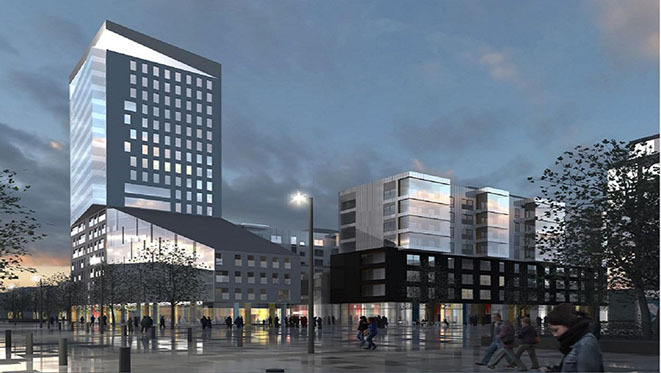 "We're happy that, as a family company from Espoo with long-standing experience, we will be able to make use of our know-how and local knowledge to realize the Suurpelto city center block," says the CEO of EKE-Construction Ltd., Tea Ekengren-Saurén. The first stage of construction will begin in 2018. The whole city center block is estimated to be completed by 2022. Total area approximately 25,000 square meters of floor area. A total of four high-rise buildings: a 20-storey tower block and three 8-storey multiple staircase buildings.